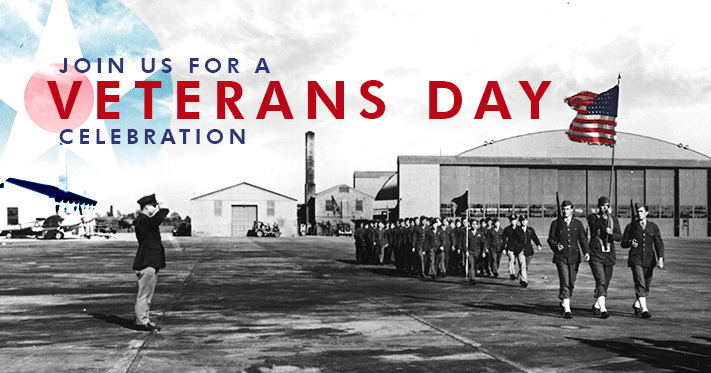 Join us at the AMC Museum for our 2014 Veterans Day ceremony on November 11th. The museum opens at 9:00 a.m. and seating begins inside at 9:50. The ceremony begins at 11:00, rain or shine, with the posting of the colors. In addition to the Dover AFB Honor Guard and special guest speaker Lieutenant General Robert R. Dierker, USAF (Ret), we will have music by the Milford Community Band. Many of the museum’s airplanes will be open for viewing until 3:45 p.m. The museum will close at 4 p.m.
Veterans Day is a time to remember that the freedoms we enjoy as Americans have come with a price, and have been earned and perpetuated by the brave men and women who have answered the call to duty for their country. Without their dedication and sacrifice, America would be a very different place today. Come and join us in thanking America’s military veterans through this very special ceremony. World War I, known as “The Great War” or “The War to End All Wars”, officially ended on June 28, 1919 with the signing of the Treaty of Versailles, signed in the Palace of Versailles, France. Hostilities actually ceased seven months earlier on Nov 1918, on the 11th hour of the 11th day. This moment in time marked the cessations of the most destructive, costly, and far-reaching war in human history.